It’s curious sometimes just how quickly interesting people can come and go in one’s life, and even more compelling how service can provide a framework for these exchanges. This is how I felt upon meeting Mr. Philip Levine. It was early and gray the morning of January 23, 2015. I was fresh off my Fiji trip with that new joy for service in my soul. I was determined to share some of it as I went from room to room taking meal orders in my classy volunteer garb. 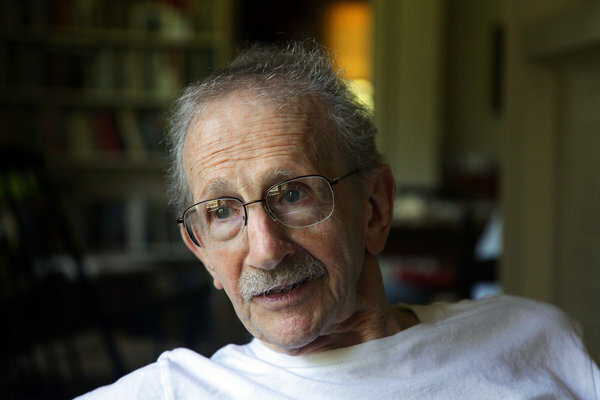 Every time I volunteer at St. Agnes I meet at least one person who likes to stop and share advice or stories between meal-planning, and this day, it was Philip Levine. He seemed to be just an average patient, but he intrigued me somehow. After we’d planned his simple meal, we somehow got on the subject of travel, or perhaps culture first, I can’t remember. I told him a bit about serving in Fiji, and he nonchalantly mentioned all the places he’s been (which were so many I can hardly recall them now). I’m 100% Portuguese, and so he told me tales of the beauty of Portugal, and highly recommended that I travel there. He collaborated with a Portuguese man on a book of poetry once. “You’re a POET? !” I exclaimed, a little too excitedly, “where can I buy some of your works?” (His heart would begin to beat too hard at intervals, and he’d have to stop, breathe, and rest for a few minutes, the pulsing in his neck was visible and very rapid, but I was patient. I felt that I brought a bit too much energy.) He said no need, and he gave me one of his books on the spot! It was titled “News of the World.” He continued his story, but throughout, casually mentioned prizes, professorships, etc., as I marveled at his achievements and humility. He was a Pulitzer Prize winner and a professor emeritus at Fresno State, to name a few contributions. I was so inspired. I cracked open the book, and found a voice for the average soul, and in some particular ones, the Fresno soul. I asked him to sign it, and he did, although it was a visible struggle. I thanked him, and we chatted a bit more, but soon I could see he needed rest and I needed to curb my curiosity. I bid him good bye and get well. Sometimes, you walk out of a hospital room subconsciously accepting that you will probably never see a person again, whether by healing and return to the daily grind or by the final departure. Other times, it hits you. It wasn’t until after he passed a few weeks ago that I learned just how influential Mr. Levine really was to Fresno State and the realm of poetry. How fortunate I was to chance to meet the man! He used his gift to turn our Fresno experience into art–a service indeed. He enjoyed jazz music, and collaborated with Dr. Benjamin Boone, a professor with a wonderful commitment to service-learning, in setting some of his works to music. The project is just about done, you can listen to some tracks here. Dr. Boone described him as “spontaneous,” and said Levine “had a confidence in his work–in art–in our project that was refreshing.” I would have loved to have Levine as a professor here at Fresno State. Service has brought me to bizarre places, introduced me to incredible people, and filled my life with so much meaning. 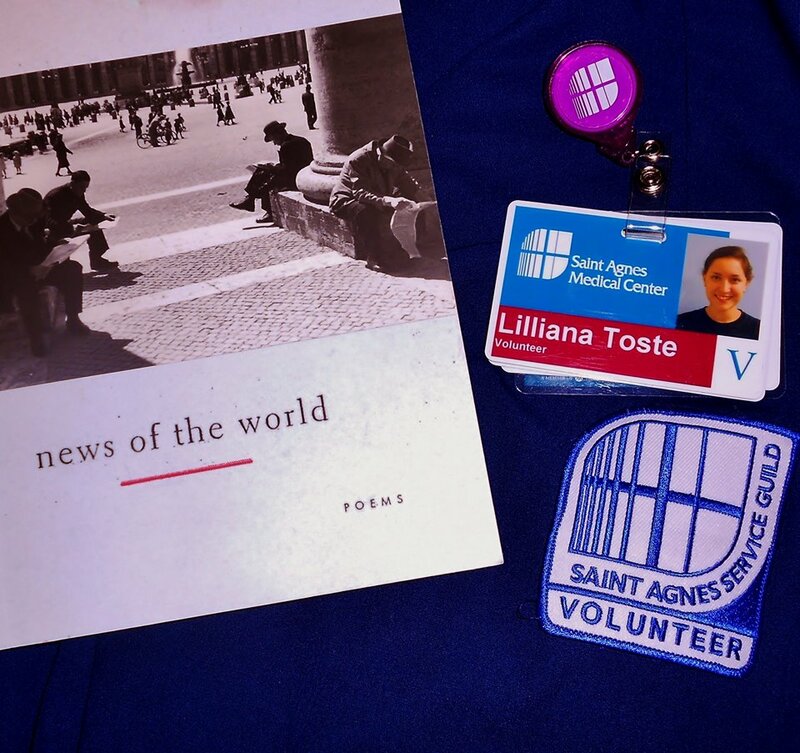 This is just one instance of amazing learning and a fun connection I was given through first my excitement surrounding service abroad, and my actual presence as a St. Agnes volunteer. I won’t soon forget my fortunately-timed meeting with Philip Levine and his quiet, confident love of poetry that is such a beautiful contribution to our community. Have you ever made an unforgettable connection at a service opportunity? Who has inspired you? As the holidays approach, individuals take the time to reflect about what they are thankful for and are often more willing to donate food, some of their time, and attention to those less fortunate. Because people are filled with the spirit of thankfulness and giving back, the National Coalition for the Homeless and the National Student Campaign against Hunger and Homelessness sets aside the week prior to Thanksgiving every year to sponsor the National Hunger and Homelessness Awareness Week. During this week, more than 750 high schools, universities and community groups all across the nation unite to raise awareness about hunger and homelessness. This year, NHHAW will take place November 17th-22nd on our campus. Fresno State will be participating in NHHAW through the engagement of service learning classes, clubs and organizations in different events and activities to bring awareness to these social issues in the nation, California and the San Joaquin Valley. Your participation in the National Hunger and Homelessness Awareness Week will not only help raise awareness for the community, but can help build your leadership skills as you collaborate with your friends, classmates and other student leaders. Collectively, we can work to eliminate the myth that hunger and homelessness are inevitable in our society and instead realize that ending hunger and homelessness is attainable. I encourage you or your organization to participate in the National Hunger and Homelessness Awareness Week. You might know someone who is affected by hunger or homelessness. You might know someone who knows someone who is affected by these issues. Regardless, think about why this week is important and the impact your service can have on our community. What ideas do you have that can help raise awareness about hunger and homelessness? If you cannot donate your time, what else can you do to end hunger and homelessness? In a previous blog post, I wrote about an opportunity to get involved on this campus by joining Camp Kesem Fresno State. Because this is our first year, we are learning and growing, so I wanted to give you all an update about it. As a recap, Camp Kesem Fresno State is one of many chapters across the United States that is geared towards helping kids ages 6 through 16 who have or had a parent that was affected by cancer. The chapter has various responsibilities, and we break up into committees in order to achieve our goal of sending these kids to camp in the summer of 2015. Develop and implement counselor training program, including all logistics, planning of sessions, guest facilitators, completion of online assignments, etc. Please consider becoming involved with Camp Kesem Fresno State even if it’s just by spreading the word. Sadly, almost everyone can relate to cancer by either having gone through it, seen someone close suffer from it, or know someone who is affected by it. 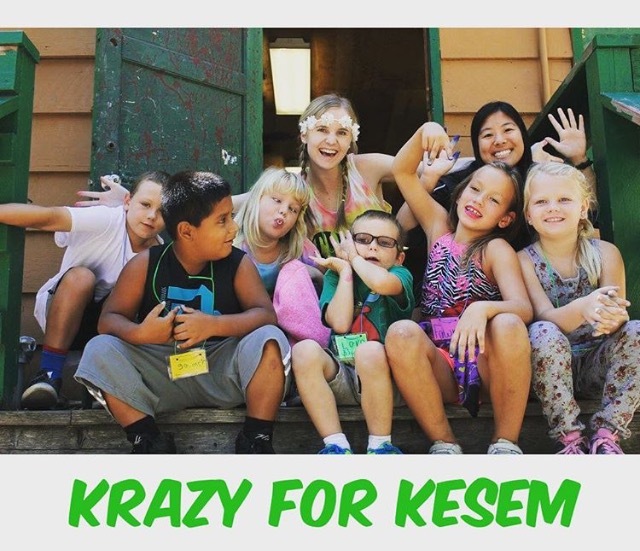 Camp Kesem can be a way to make this horrible disease seem less daunting by improving the lives of those who are affected by it. For more information on how to get involved with Camp Kesem, please contact, fresnostate@campkesem.org. Every Friday, a group of Fresno State students from our new chapter of the Food Recovery Network is given an incredible, not-so-secret mission: help combat hunger in Fresno! They split up and strategically collect food that, under normal conditions, would have been thrown away. This is yummy cuisine that has been prepared, but never served, from restaurants and vendors around Fresno. There is a time frame in which the students may recover the food from various locations (including, but not limited to produce from a local farmer’s market, DiCicco’s, Dusty Buns, and Fresno State’s University Dining Hall). Once all the food has been collected, they then reconvene at St. Paul’s Catholic Newman Center, and are charged with the next portion of their mission: to prepare a meal from the delicious victuals they’ve recovered. 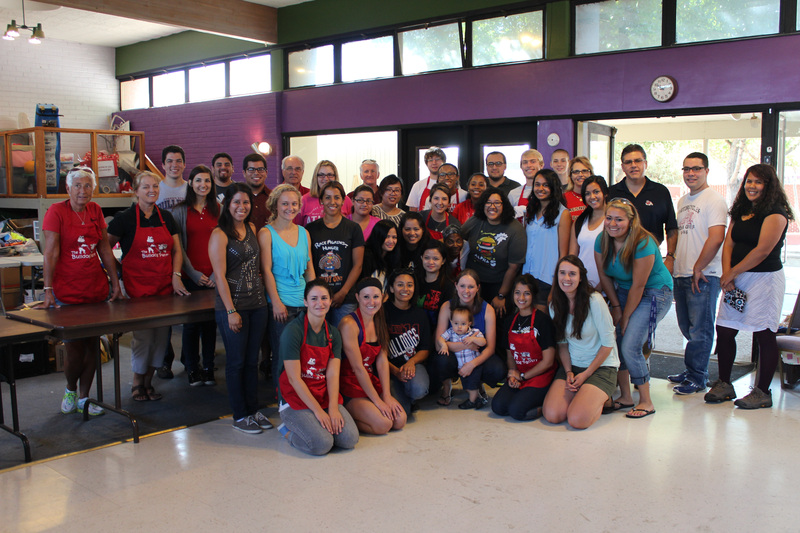 A team of committed volunteers from the Newman Center and the Fresno State students creates a menu and cooks up a storm! In the end, anyone is welcome to a free hot meal, at 6:30 pm Friday night, in the cafeteria at the Newman Center. 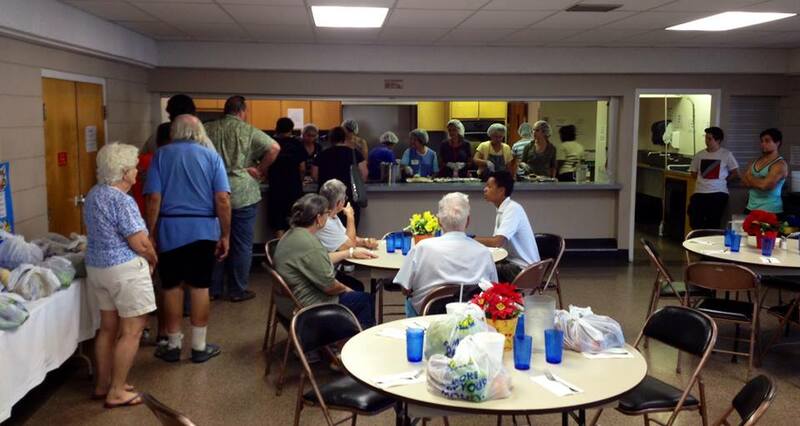 I have been volunteering at the Friday night dinners since they began this past summer. They require a lot of work; we have anywhere from 50-80 dinner guests per week! 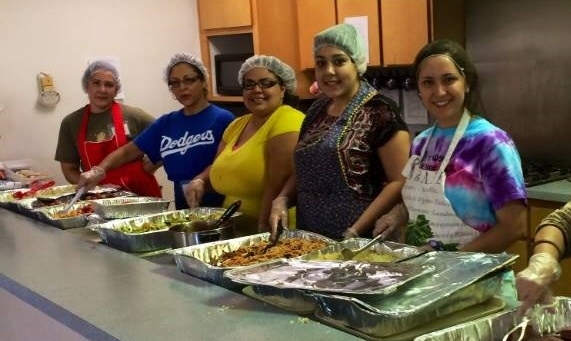 As I’ve volunteered, I have gained a lot of experience with food preparation, as well as learned more and more about the issue of food insecurity in our valley, and in the Fresno area. 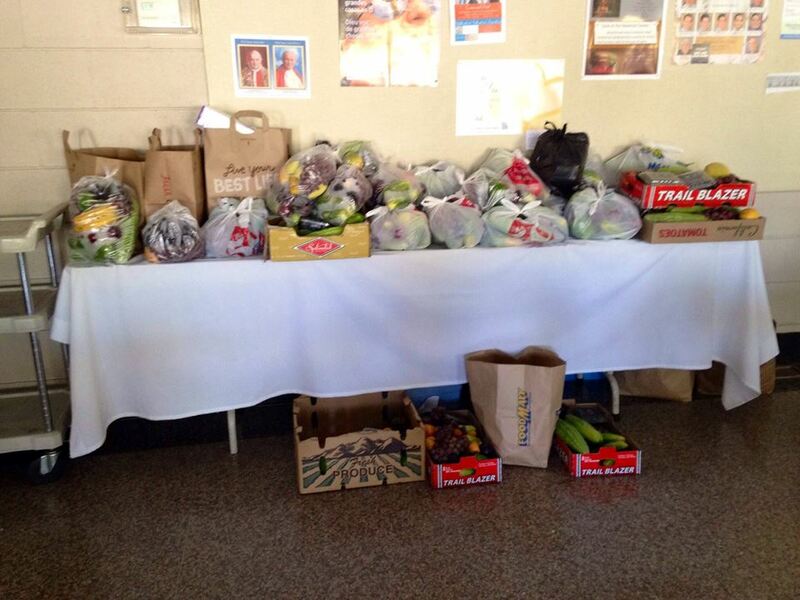 On an even smaller scale, I learned that 1 in every 3 Fresno State Students is “food insecure”. That is too many hungry students! Luckily, I can assure you that those in positions of leadership on our campus have been meeting and developing ideas for a brighter future for our hungry students, and students are encouraged to keep ears open for news of new programs and supports. 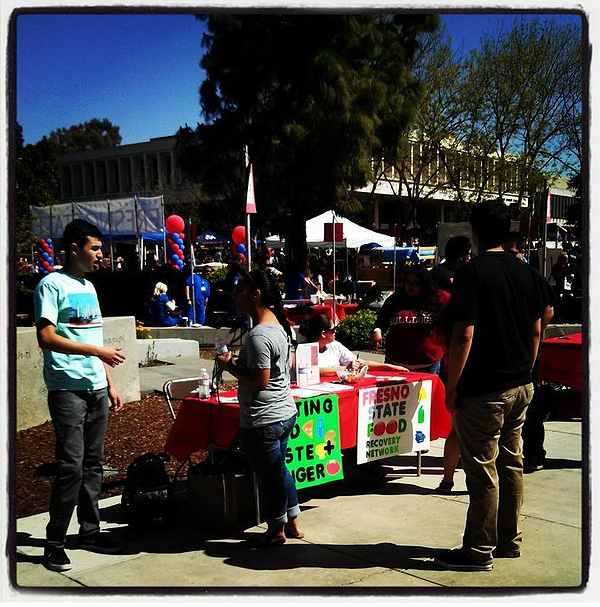 The Food Recovery Network at Fresno State has already begun making waves; we’ve even made it in the media! Bright ideas and inspiration are always encouraged, and student volunteers are welcome! You can see the steps to becoming an active volunteer here, and contact directors Dr. Janine Nkosi and Dr. Sarah Whitley, or President Rose Cardoso for more information. At the very least, please join us for dinner one Friday night. We don’t want any food to go to waste! How can you complete the mission to solve Fresno’s hunger problem? As a Richter Center Ambassador, I am charged with the honorable duty of sharing the value and importance of service to the community among my peers at Fresno State. With this responsibility comes a certain degree of freedom to spread my passion for service work and the avenue which I most often find myself taking is one in which my actions speak louder than my words. I was raised to believe that, at the end of the day, it is that which a man or woman has accomplished in the pursuit of some higher purpose that speaks for itself, not the explanations, excuses, or promises to do better next time that should do the talking. When I speak with students , clubs and organizations on campus, or faculty/staff/administration about the need for active volunteerism in and around the Fresno community I always stress that while it is a good start to think about ways in which you can serve and “try on” (so to speak) a few service sites, some of the most rewarding service work comes from a sustained commitment to one or two organizations. I find that many of my favorite, most enriching experiences as a volunteer have come from my on-going commitment to the Bulldog Food Pantry. The Pantry provides food for more than 200 families every week and every weekend volunteers from the Fresno State community gather to pack bags of food and distribute them to our many clients. I get a sense of satisfaction every Friday afternoon, when I join the truck convoy that picks up the food from the Community Food Bank and delivers to the Pantry because I realize that my efforts, insignificant as they are in the grand scheme of the benevolent machine that is the Pantry, are appreciated by many. My available time to volunteer at the Pantry has decreased as the years go by, but I still make it a point to lend a hand whenever and wherever possible because I believe in the work of the Pantry and I want the world to become as passionate as I am about their mission. I choose to ‘walk the walk’ and find it to be very satisfying. Now, as a word of encouragement: Let your actions sing your praises as a leader in service! Take pride in the fact that you are a leader in community engagement! Know that your generosity and selflessness are directly benefitting and improving the lives’ of your fellow Fresnans (and beyond)! As Jan and Bud Richter, whose philanthropy and desire to instill positive change in the Fresno community by providing a means for students at Fresno State to learn firsthand the importance of being a champion of service, said during the dedication ceremony of the Jan and Bud Richter Center for Community Engagement and Service-Learning in November of 2007, “We believe that this Center will help foster a set of values and habits in Fresno State students that are similar to the motto that we have tried to live by, ‘Do unto others as you would have them do unto you’.” What is implied here, of course, is that action must be taken to ‘do unto others’. So what are you waiting for? Find that special place to serve that enriches your life and brings you satisfaction, then keep up the good work! For more information about the Bulldog Pantry, feel free to email us at thebulldogpantry@gmail.com. What is your service passion? Where do you like to regularly volunteer your time in order to make an impact? In the early morning hours of Saturday, March 22nd, 2014 a group of faculty, staff, students, and community volunteers gathered on San Ramon avenue in front of the Science II Building at Fresno State to begin work beautifying the grounds and creating a water-wise garden, showcasing the university’s commitment to being a leader in responsible, sustainable practices in the San Joaquin Valley. The Richter Center for Community Engagement and Service-Learning hosts multiple one-day service events in the fall semester and one such event in the spring. The 2014 iteration of the Richter Center’s spring service day was called ‘Spring Into Service’ and featured new and exciting partnerships with different groups and individuals, including Associated Students Inc., Fresno State EES professor Dr. Mara Brady, and Associate Vice President for Facilities Management, Bob Boyd. 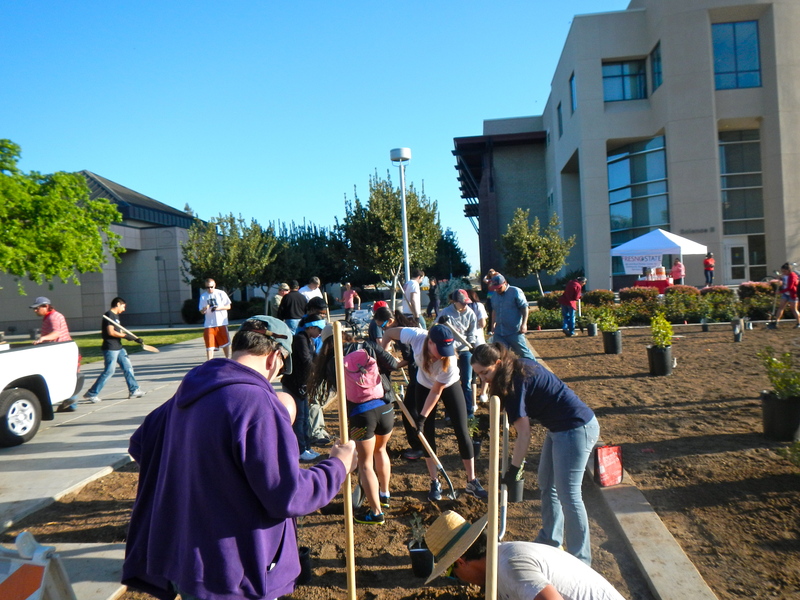 With more than 30 individuals, the work was completed rapidly and before lunchtime, more than 800 new trees, shrubs, and ground cover plants were successfully transplanted into many of the parking lots on the east side of campus. 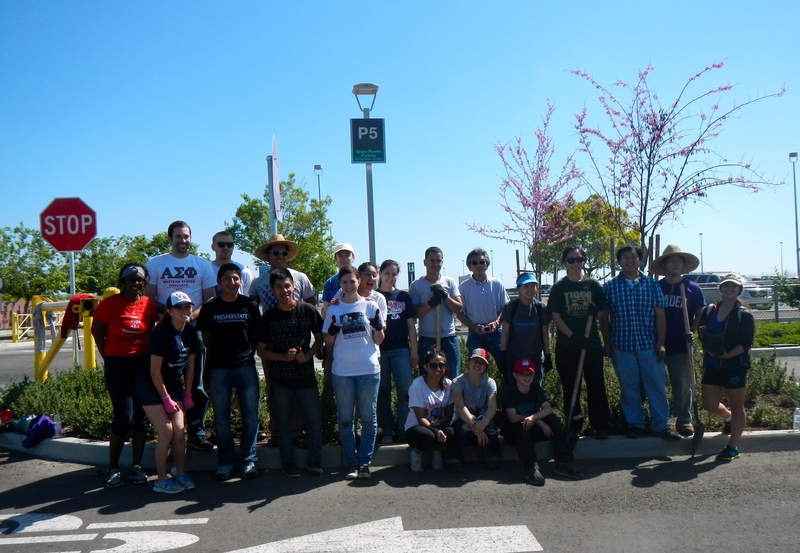 Three other sites also featured ‘Spring Into Service’ events: Woodward Park (Fresno P.A.R.C.S. ), the McKenzie Preserve (Sierra Foothill Conservancy), and the Boys and Girls Club in the El Dorado Park neighborhood west of Fresno State enjoyed the work of over a hundred volunteers in completing meaningful projects. What was especially exciting about the work done at Fresno State was that the project was held on the same day as the 2014 Preview Day, in which thousands of incoming Fresno State students and their families visited campus to learn more about the academic prowess of our school. 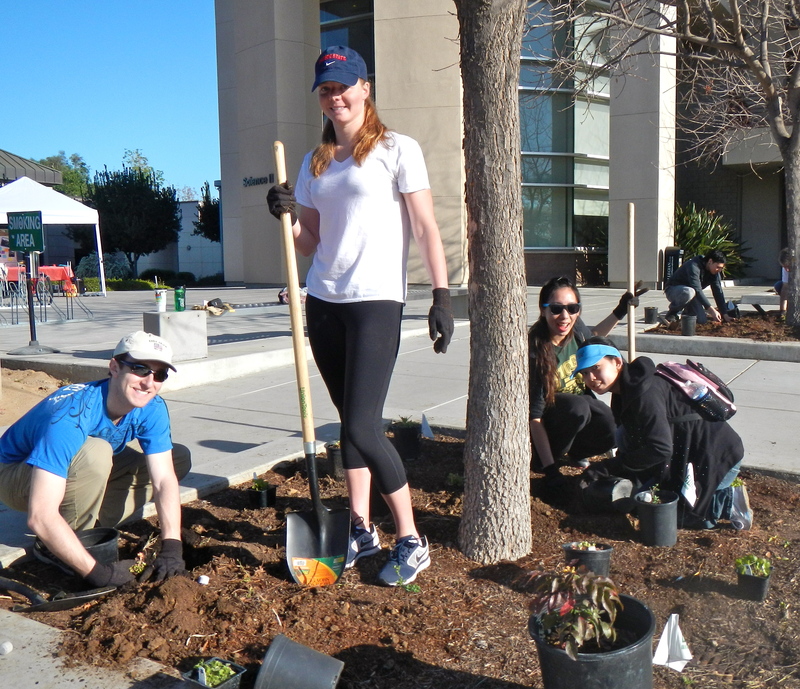 However, as many walked past the volunteers planting trees in parking lots adjacent to the Smittcamp Alumni House, these people were also able to witness first-hand the culture of service that exists at Fresno State. Hopefully they are now able to realize that the more than one million hours of community service work that we as an institution completed in each of the last four academic years are not just numbers on a page; indeed, it is the work of the students, faculty, staff and administration who give so freely of their time and energies for the betterment of the greater Fresno State community, like those who labored early on a Saturday morning, that sums up to a tremendous impact in our city. After a delicious lunch, courtesy of Subway Restaurant, volunteers were asked to reflect on their experiences that day. For many, this was a new experience, but having the opportunity to talk about the work that was done and why it was important was meaningful to all of the volunteers as many expressed when it was their respective turn to talk. Even more exciting than hearing what the volunteers thought of the day was hearing what they planned on doing as a result of Spring Into Service. Many said that this was one of their first service projects, but that they did not plan on making it their last and were eager to learn about ways to get involved with the Richter Center. As related to these students on ‘Spring Into Service’ day, the Richter Center student leadership groups are currently accepting applications for the 2014-2015 teams! Students are encouraged to apply for the Richter Center Ambassador program, the S.E.R.V.E. (service experiences through Richter volunteer events) committee, and the ReFs (Reflection Facilitators) program. Visit our Recruitment webpage for more details and to download an application. Applications are due on Friday, April 25th at 12:00 PM. Stop by the Richter Center in Thomas Building Room 107, call 559.278.7079, email fresnostaterca@gmail.com, or speak with a current member of the RCSL team for more information! What are your spring service plans? Did you participate in Spring into Service? What about the experience sticks with you?